At 10k rpm the clutch is only doing 5135 rpm due to the primary reduction gearing, but yes I'm confident it will be fine. With it being a track bike I will be keeping a close eye on the clutch assembly as a whole anyway, especially as it's in an experimental stage. Did you already do something with different valves and camshafts? I did look into using 76mm pistons from the CBR1000RR but it raised more problems than gains. They're forged slipper type pistons designed for use in nicasil cylinders and so the steel liners that we use probably won't expand quick enough and will result in seizure. The head gasket is perfect for a 74mm bore but would have to be modified or replaced for 76mm. The valves are set at a steeper angle and so the cut-outs on the pistons would need re-machining to suit. As no other performance bike uses rods the same size as ours, I would have to have custom rods built. I don't really think they're needed at the moment. As far as the valves go, I will be fitting +1mm stainless 1 piece ones and performance cams at a later date. I prefer to use the standard ones first to get a datum figure that I can judge any losses / gains by. This seems like a good time for an update on the project. The cooling system is plumbed in and seems to resemble something workable. The engine holds oil with no leaks. The exhaust headers I have wrapped to keep as much heat away from everything else as possible. 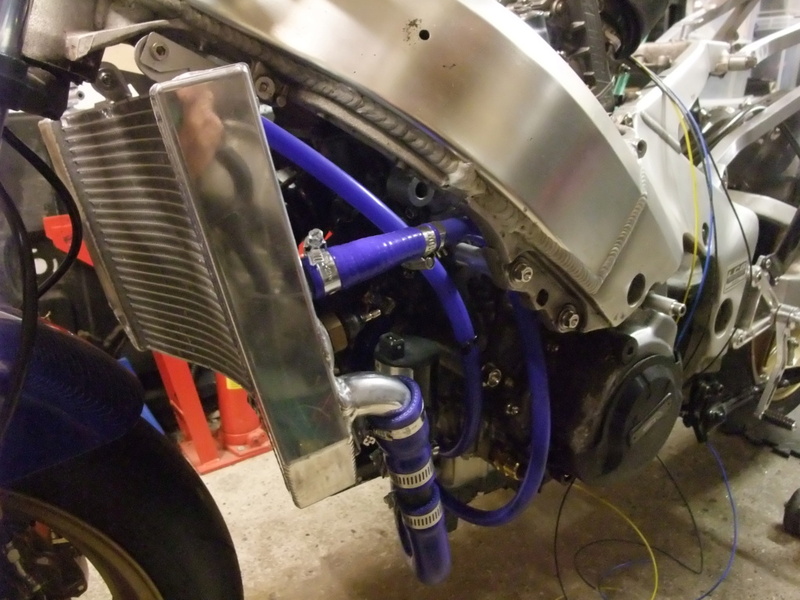 The new alloy race subframe fitted and functional. 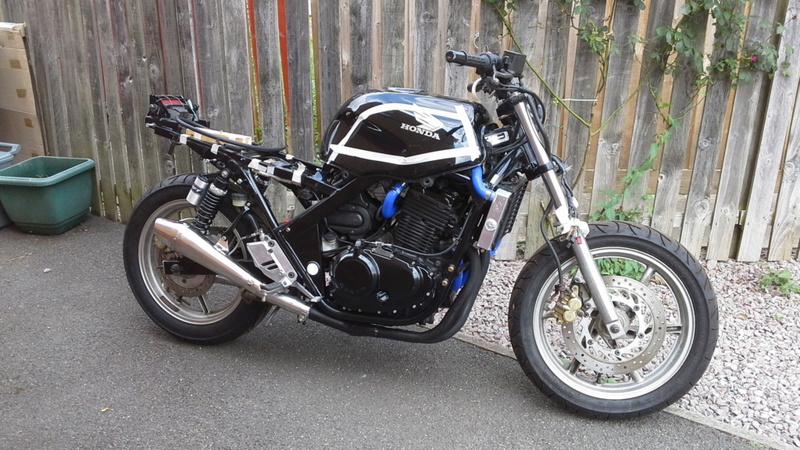 I'm at the moment part of the way into building a new loom for the bike, once this is completed then in theory I just need to add fuel and start it. Realistically that sounds much easier than it will be I'm sure. Mainly due to the fact that the carbs are not jetted for this engine, as well as many other factors which I will only find out in due course. 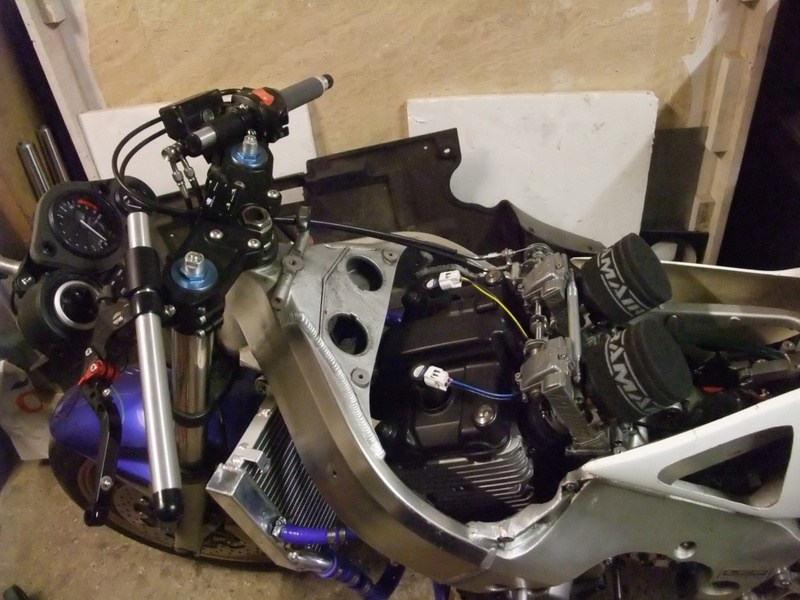 At present the bike weighs in at 135kg, that does include the seat unit fuel tank and chain etc. The fairing weighs 4kg so as it stands I think the ready to go weight less fuel will be around the 140kg mark. (That was weighing the front and back seperately. How accurate that is I really don't know) But still a good saving on the original weight. For the eagle eyed ones among you, the sidestand won't be on the finished article it's just there for my convenience at the moment. That sounds like a really worthwhile weight saving. Should make it really nimble. All I need to do is to get myself into a more nimble state! I actually prefer black hoses myself but had spare blue ones lying around. They aren't going to be too exposed as they'll be within the fairing. @Beresford wrote: That sounds like a really worthwhile weight saving. Should make it really nimble. Chav? How very dare you? Have you seen this website: Baguette croissant fromage ? Don't know if they made there piston to measurement or they grabed Blade pistons..
Where did you get that radiator? Nice bike mate! @bviep wrote: Have you seen this website: Baguette croissant fromage ? Very interesting link. I'll investigate this further. Rad was off ebay. Came from usa for £70 but looks very much like some from china. The bike is coming together, ive been trying for a while to get rear subframe welded up but am struggling to get someone to do it. Ideally want it doing here at home. A friend has a fabrication workshop about a mile away and i'm happy to push it there but there is always a reason why he cant do it at the moment! Seat unit is painted and ready to fit and the tank will be winter project. Are those popular rods in england? I personally have never heard of Saenz perfomance. Tuning these bikes to this extent over here is very rare, mainly as it's not allowed in the racing class (and very expensive). In fact if I had known of this company earlier, I would have used a lot of their stuff which would have saved me a lot of time wasted on research and trial and error. Which would have meant that my bike would have been finished long ago. Well maybe not finished as projects are never finished really, but certainly rideable at least. At least I have learned that 76mm is doable and gaskets are available for my next engine. 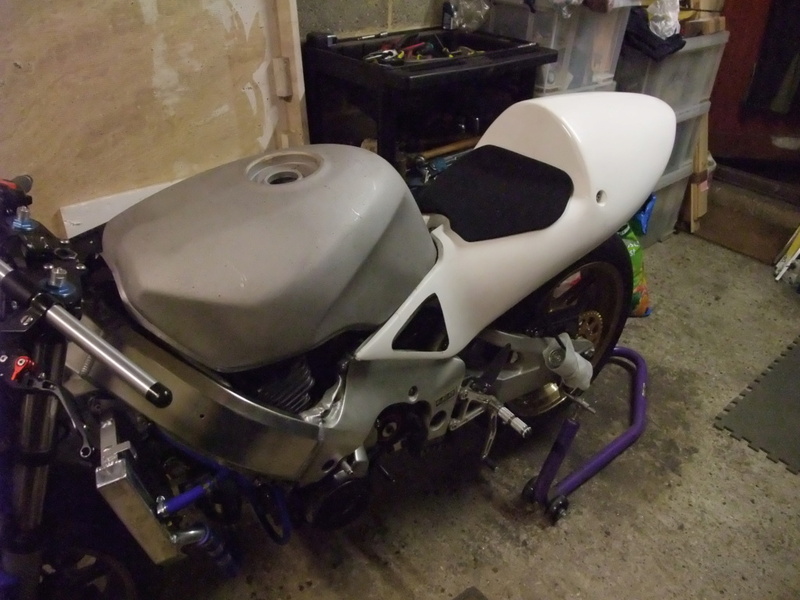 Bit of an update whist I'm at it, I have just ordered the race fairing for the project. I was hoping to leave it closer to completion, but it's needed to see where I can fit everything in. I have decided to build a second track bike alongside this one. Again CB500 based, but this one will be retaining the original frame. It won't be built up to any race regs, but just to see how much I can improve on the original model. Oh how I wish I didn't click on the baguette croissant link!! Come on Andy big push, wicked project with really fine detail but waiting for the pics and updates is killing me. What stage are you at with tank / bodywork / paint? Any track or dyno time booked for a shakedown? I'd love to see the bike 'alive'... Hats off to you Sir! @tt fan wrote: Oh how I wish I didn't click on the baguette croissant link!! I HAVE TO AGREE WITH YOU ON THAT LINK!!! I have to concentrate on the minor details like throttle cables, wiring loom, gear linkage and jetting the carbs before I can run the engine. They sound minor but are quite important I guess. The titanium gear linkage rod has just arrived! Another minor but important detail I can cross off my list. I ordered the fairing from tyga europe, but they can't deal with us in the UK. (So much for free trade) but I'll be ordering it from Jap4 who is our tyga supplier here once they refund the cash. 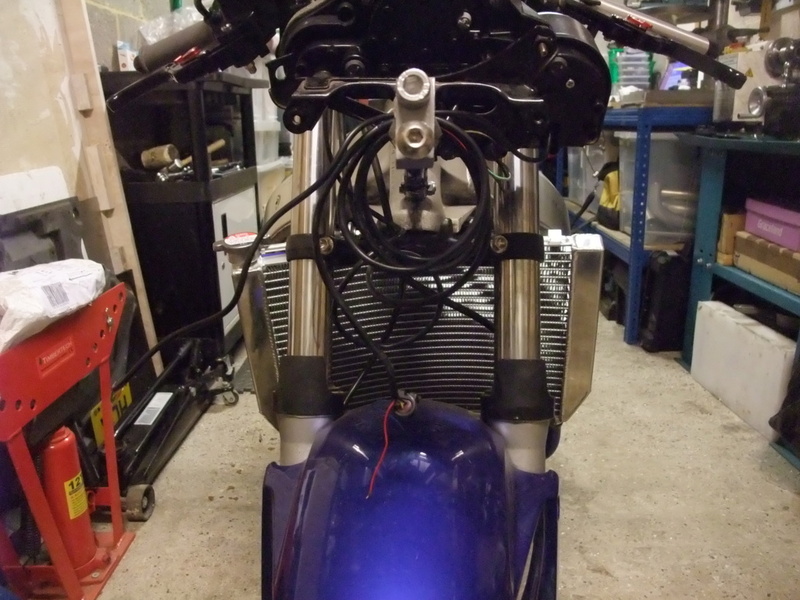 The seat unit is an RSW250 unit and the tank will be an NC29 one modified underneath to allow for the taller and more upright engine and carbs. I use the dyno at PDQ which is less than five minutes away so I don't have to worry about long term planning for a dyno run. I do have air/fuel calibration equipment and had a lambda sensor built into the exhaust from the start with this in mind, this allows me to sort out the jetting to 95% accuracy before I need to fork out for dyno time to fine tune it. Well I'm off into the garage now, as I can assure you that nobody wants to hear the engine running than me!!!! 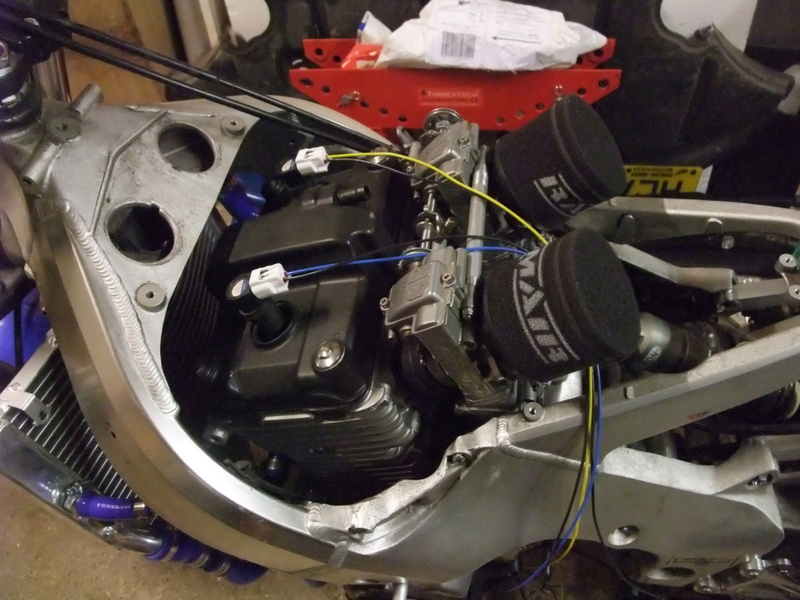 Jobs to do today are, gear linkage, compression readings, fit chain, finish the throttle cables (Venhill self build kit) and check space for a larger capacity battery. (Don't believe all the stuff you read about lithium batteries, they're much lighter and don't need to be upright. But they don't have the power of the conventional ones!) I may have to link two rather than rely on one. I'll try to post some photo's later. OK, so i'll try to give more regular updates. If only to motivate myself! The gear linkage turned out to be more work than expected as the play in the rose joints was exccessive and I couldn't bring myself to accept that, new ultra heavy duty ones are on their way now. 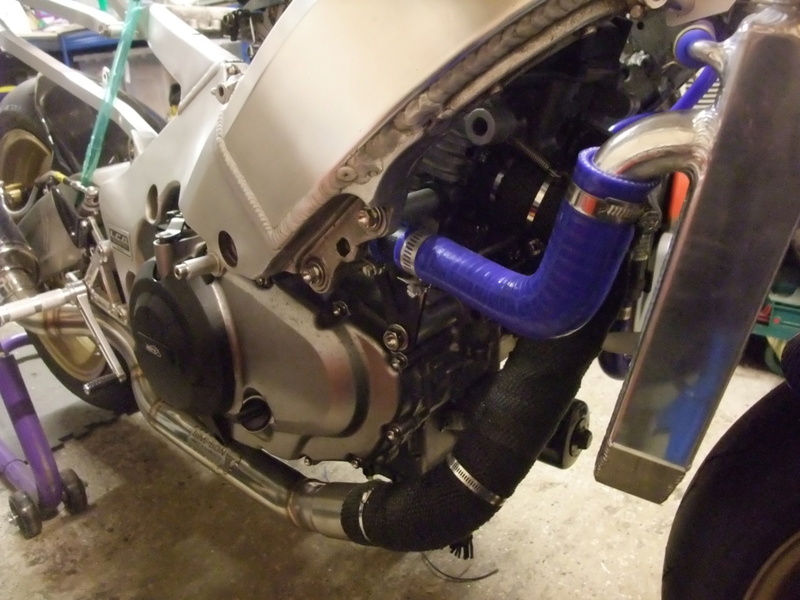 The throttle cables have been built to suit and work well. The compression readings were as expected, not as high as you would think due to the new bores and pistons, the cold engine and slow turnover speed but they were equal which is most important at this point. 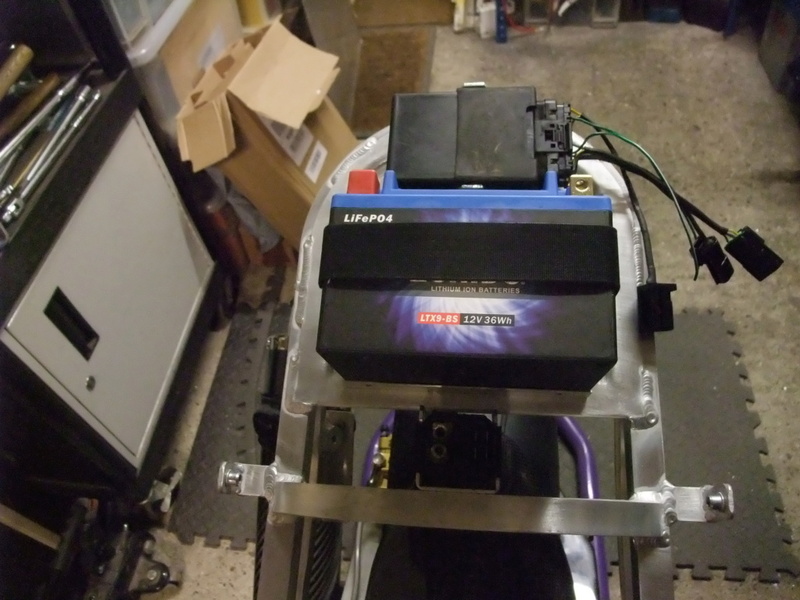 There is room for a higher capacity battery, but I won't bother buying one until it's ready to go on track. The chain I didn't fit as I still need to remove the swingarm to fit the chain slipper and the sharks fin protector. A job for next weekend. Looking good, now it's taking shape! Glad you didn't compromise for a sloppy linkage! Rose joints arrived so ready to put on the gear linkage at the weekend. I ordered the fairing today so that should be here in a couple of weeks. 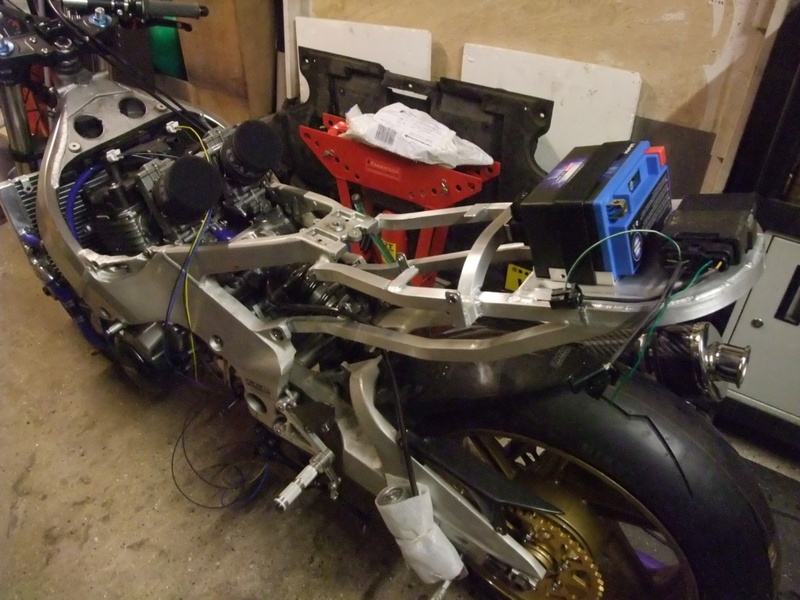 Tasks for this weekend are to remove the swingarm to secure the chain slipper and the shark fin guard. Put it all together again and fit the chain and gear linkage. If I have any time left I'll progress with the electrickery. I had to work on my car most of last weekend so very little progress has been made on the bike. In fact depending on the way you look at it it could be seen as a step back. I decided to do a leak down test on my engine and was very surprised at the results. I normally do a fluid check on the cylinder head once I have the valves in. This entails having the head upside down and filling the combustion chambers with a penetrating fluid like brake cleaner to check for leaks. I'll finish this update as soon as I can. Well the fluid test was great with no leaks at all. I did a leak down test using 30psi of compressed air, mainly to test the piston ring/ bore seal. It turned out to be the inlet valves letting out a lot of air under pressure. Well as I wasn't happy with the outcome of this I took the head off and decided that I would fit new valves and recut the 3 angle seats. As I wanted to fit bigger valves eventually I decided to bypass the standard ones and go straight to the 1mm oversize ones that arrived today. I also ordered some phosphor bronze valve guides from the states which allows for more valve lift from the race camshafts that I'll be fitting too. 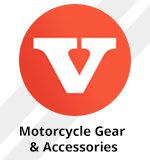 The new valve seat cutting tools are on order too. A setback for the moment but better in the long run I believe. At last a little progress! The gear linkage, chain slipper and chain are now fitted. 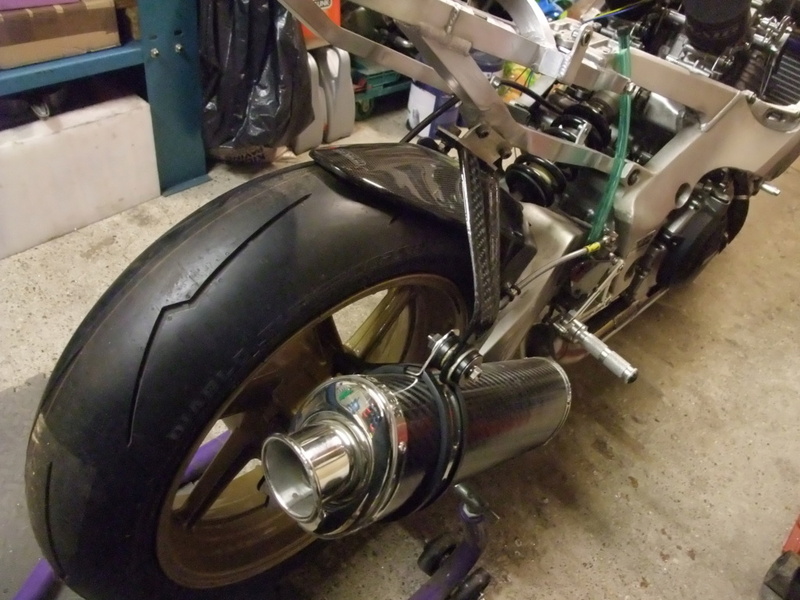 The R&G toe protector thingy is also fitted, I'm not very impressed with the way it looks but the width of the lower face of the swingarm is very restricted. It is what it is I guess. I finally secured the remote adjuster for the Nitron shock to the alloy subframe. 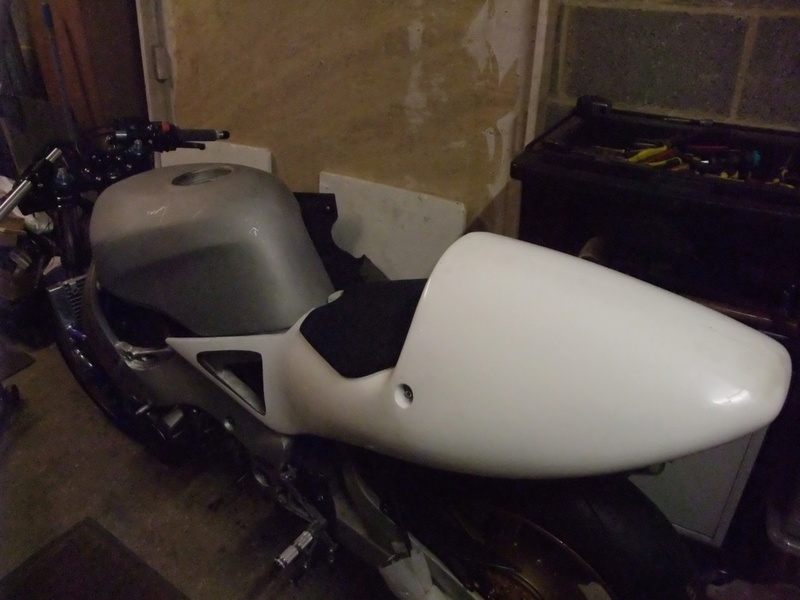 The fairing should be arriving next week, looking forward to seeing how it looks. It seems like forever waiting for the new valve guides and cutters, as they're coming from the states it's to be expected I suppose. I was looking at the size of the inlet and exhaust ports in the cylinder head, and they look soooo small when compared to the ports in a fireblade cylinder head. This I will have to look into. I'll post some pictures once the fairing has arrived. I'm not going to bother with the belly pan to begin with, as I would have to make changes to the exhaust which I'm not prepared to do at the moment. Maybe once everything else is finished. I'll get some pictures up at the weekend, I haven't got the space in the garage at the moment. Dragging it out in the rain for a photo shoot this evening has zero appeal to me.